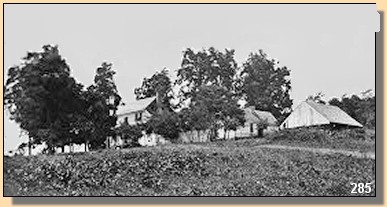 Confederate artillery firing from the mountain as well as from a small wooded knoll known afterward as the Cedars, and from a gate where the Crittenden House lane met the main road, dueled with Union artillery posted on the Mitchell Station Road. One Confederate thought the gunnery was "the prettiest artillery duel ever witnessed during the war." During the spectacular but inconclusive shelling both Stonewall Jackson and division commander Brigadier General Charles S. Winder tried their hand as gunners. Soon Winder was carried off of the battlefield mortally wounded when a Northern shell tore away his side. 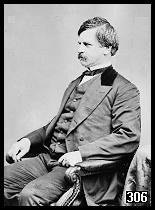 The battle entered its most furious phase shortly after 5 p.m. when the Federal commander, Major General Nathaniel P. Banks, launched two attacks against the Confederate line. Union infantry waded through a cornfield heading for the Southern guns at the Cedars, while a second group of Northerners advanced toward the guns planted by the Gate. 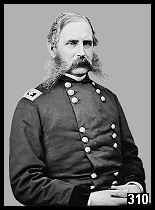 Although outnumbered by Jackson's troops, Brigadier general Samuel W. Crawford's Unionists struck Jackson's loosely-knit line near the Gate. Crawford shattered Jackson's left after a desperate hand-to-hand combat that one veteran remembered as "unsurpassed for ferocity by any other engagement during the war." 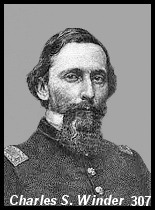 The Federals in the cornfield under Brigadier General Christopher C. Augur billowed out of the corn near the guns by the Cedars. The Confederate guns at the Gate, and the Cedars retreated while much of their infantry support fled from the Union onslaught. Jackson rode into the center of the storm waving his word with the scabbard still tightly rusted to it. Defying fire from three sides, Jackson brandished his "sword" and a battle flag, and banked on his name to rally the troops. One witness wrote later, "the escape of Jackson from death was miraculous. He was in the thickest of the combat, at very long range." The famed leader arrested the panic and restored order. A.P. Hill's timely arrival established a stronger line and sent the Federals reeling back across the fields. A small battalion of the 1st Pennsylvania Cavalry galloped into the teeth of the Confederate counterattack to buy time for the retreating Federals. As darkness fell, Jackson embarked on a concerted attack that swept Banks from the field. Jackson's 22,000 Confederates came dangerously close to defeat at the hands of the Banks' inferior but aggressive force of about 12,000 Federals. Cedar Mountain was the only battle in which Stonewall Jackson attempted to draw his sword and lead his troops by example. 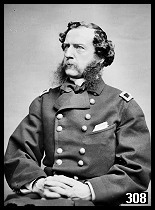 Swayed by his personal involvement, Jackson later asserted that Cedar Mountain was "the most successful of his exploits." Two days after the battle Jackson withdrew to meet Robert E. Lee, and begin the campaign leading to the battle of Second Manassas and the demise of John Pope. Once joined with Lee, Stonewall Jackson never again directed a campaign as an independent commander. Federal battery fording a tributary of the Rappahannock River on the day of battle.